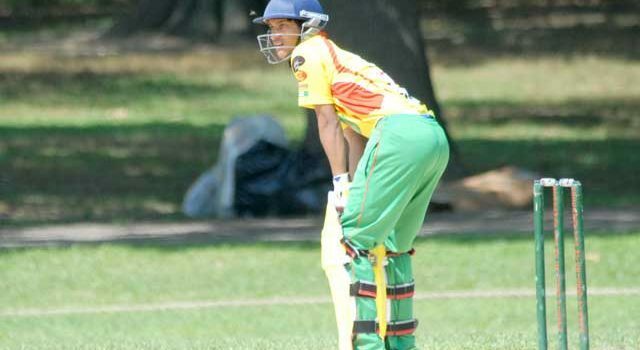 Akshay Homraj, the belligerent opening batsman who played for Guyana U-19s and was even part of the Final selection trials for the USA cricket team, put on a batting display at Grout Park. A diminutive batsman with excellent hand eye coordination, Akshay took the Tricity bowling attack apart putting them to swords. Chasing a modest 121 to win their T20 game, Akshay got the Good vibes to a blazing start hitting 22 of the very first over. That assault continued through the innings as he produced a blazing innings of 81 studded with 5 sixes and 10 fours, 70 off them coming in just boundaries. He took a special liking to the medium pace of Fizal Hussain hitting him to all parts of the ground with 26 just coming off just 1 over. Giving him company at the other end was the Anil Sahaman, the allrounder, who himself was in great form in his breezy innings of 22. Good Vibes romped home in the 9th over. Earlier, Tricity won the toss and decided to bat in what was a bright and sunny day. Opener Ajai Ishmael and Videshwar Mangra gave a stead start to Tricity as they both ventured into 20s. Mahesh Raghunandan then castled them both in quick succession. Fizal Hussain, coming in at 4, then held the innings together with a run a ball 25 that included 2 sixes and 2 boundaries. Akash Ayana and John Persaud made 14 each as the Tricity finished their innings at a sub-par 120 for the loss of 6 wickets. For his stunning display of batting that razed thru Tricity, Akshay Homraj was adjudged the Man of the Match. Defending just 103 in a 40 over game, the Highlanders were in for a tough fight. With just 2 runs per over needed, the Panthers batsman resorted to some brilliant rearguard effort thereby forcing the Highlanders to work hard for each wicket. Kiran Vishnu held an end for most of the innings with brilliant defensive batting. He kept on batting despite getting hit flush on the glove courtesy of 2 peach of balls from Shoaib Hassan. Seeing the Panthers content on defensive play, the Highlanders resorted to test match field most of the game with forward short leg and silly point and followed that up with Test match style bowling. Shoaib Hassan and John Florent cranked up serious pace and bowled perfume balls at the batsman with some of them making the batsman jump. Shravan Matham coming it at 6 gave able company to Kiran as they both chipped away runs with careful precision. But Kiran got run out in an unfortunate fashion at the non-striker’s end for 31. John Florent, athletic as ever, dived across from his follow-through to stop a ball driven straight by Shravan, but only managed to get his fingertips. The ball ricocheted off his fingers and hit the stumps only to find Kiran stranded out of the crease. His wicket was a huge blow to the Panthers as it tilted the game towards the Highlanders. Highlanders eventually won by 3 runs. John Florent picked up 3 wickets for 8 runs in his 8 overs. Shoaib Hassan and Mike Persaud picked up 2 wickets each. Earlier, winning the toss on a beautiful day at Lincoln Park, the Highlanders decided to bat. In what was probably the last 40 over league game for them, the Highlanders decided to give game time for batsman who had not had a proper stint in the middle. That move resulted in a re shuffled batting order where the main batsman came in very late. The innings never took off as Chinmay and Claudy top scored with 15 while Saurabh and Javed made 10. Highlanders folded for 103 with 10 overs to spare. For his brilliant fast bowling spell, that fetched him 3 wickets for just 8 runs from 8 overs, John Florent was adjudged the Man of the Match. Knights won the toss and asked Falcons to bat first. The Falcons opened with Vikram Jegannathan and Vishal Sridhar. Vikram was out soon struck in front of the bowling of Hareesh Atluri. Vishal stayed put to play the long innings. The Knights allrounder Vamsidhar Varmakonda then picked 2 quick wickets off Ramathirtha Randi and Hariprasad Amanapu slowing down the proceedings for the Falcons. Dhairya Dixit then joined Vishal Sridhar and both played out crucial dots trying to take the innings deep. They played mostly with straight bat and relatively safe. Dhairya played 73 balls and produced 26 runs while Vishal scored 26 off 93 balls. Sridhar made 11 from 30 balls. The Falcons folded for 109 in the 37th over. For the Knights Vamsi picked up 3 wickets while Arun Ghanta picked up 2 wickets. Chasing 110 to win, Knights openers Raj Ardham and Ruthvik Vemareddy laid a strong platform at the top. Both played well to build a match winning partnership that eventually wrapped the game in 18 overs. Raj remained not for 36 while Ruthvik made a run a ball 33. 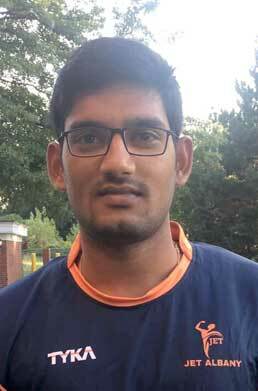 For the Falcons Vishal Sridhar picked up 3 wickets. For his excellent spell of medium pace bowling with the new ball that fetched him 3 wickets for 19 runs, allrounder Vamsidhar Varmakonda was adjudged the Man of the match. JETS won the toss and put the Falcons in to bat at a newly laid pitch at silver lake Park. JETs skipper Vishva Velichala and Chaitanya Donthineni opened the innings. Vishva played out several dot balls to settle down for a sheet anchor role. But he was out stuck in front of the bowling of Nikhil Gangrade for 2. Pardha Phani of JETS scored 47 runs and picked up 2 wickets. Mohnish Bandaru coming in at 3 got runout quickly for just 4. Pardha Phani, an inform batsman who has been having a dream season, then joined Chaitanya in the middle. Both played out the ball according to the merit and built a nice partnership. Pardha took more responsibility and played close to 60 balls and produced 47 runs. He got out bowled off the bowling of Manav. His innings comprised of numerous singles and doubles studded with 6 boundaries. Chaitanya then got bowled of Bhavik for a well-made 29. Other batsman chipped with cameos as the JETS were all-out for 142 in 36 overs. Lions skipper Bhavik Dalsania picked up 3 wickets while Dhruv Patel picked up 2 wickets. Chasing 143 to win, the Lions batsman fought and took the innings deep. But none of them stayed there long and held the innings together. Kalpesh Kathiriya played 35 balls and produced 14. Bhavik Dalsania played 33 balls for just 8. Dhruv Patel played 33 balls for 20. Krunal Tailor played 27 balls for 14. So many batsmen got the starts but could not convert them to a bigger innings because of which they got all out for 102 in 34 overs. For the JETS, Mohnish Bandaru picked up 3 wickets, while Vishva, Pardha and Ankur snapped up 2 wickets each. For his brilliant effort with both bat and ball, Pardha Phani was adjudged the Man of the match.